MaxColor, the latest development in the MaxPro suite of Prepress applications has won the Prepress innovation category for the Flexotech International awards 2011. The ceremony, which was held at the London Hilton Metropole on the 19th October is one of the most prestigious international events and is sponsored by leading companies in the industry. Speaking after the presentation, Steve Donegan of Graphic Republik said “We are delighted to receive such an accolade from such a respected source. As a young company, being shortlisted in a category with established industry players, yet winning the prize for Prepress innovation, is a proud and significant moment”. MaxColor, which was competing in a group with products from Idealliance and EskoArtwork, is an option within the MaxPro suite of applications that has been developed to help reduce the amount of inks/print stations used on press by changing/replacing existing colours. The overall benefits include increased image colour vibrancy, lower ink usage and better registration (due to reduced print stations). “MaxColor is just one of the true, innovative products within the MaxPro range. It is significant not only because of it’s ease of use and cost saving features” said Steve Donegan, “but as the judges highlighted, from the impact the savings can have from an environmental point of view. It has wide market appeal, with users such as brand owners and Prepress trade shops through to Flexo and Digital printers. Since they began working with the MaxPro suite in September 2008, Stratos feels the decison was the right one. The key factor is that the MaxPro RIP converts postscript or PDF files into a Raster format at the beginning of the process. “Previously we were carrying out technical tasks such as trapping and colour editing in a Vector environment which was complicated and process intense”. 1) Internal colour conversion via MaxColor Profile - Unlike ICC profiles, MaxColor profiles are generated from industry standard colour libraries (e.g. Pantone) or custom spot colours, using the LAB values as reference. The resultant MaxColor profile is used to convert a) RGB/CMYK Tiff images or b) MaxPro files which can include text as well as images. In the case of MaxPro files, the user has the choice of whether to convert image only, text only or both. 2) Post conversion editing - Once the file has been converted, MaxColor provides tools for image enhancement via individual separation curves and individual or colour combination selective editing. A colour meter tool allows the user to monitor changes made and a comparison image feature provides a before/after view. 3) Monitor Calibration, Display profile and Display Dot Gain Curve - MaxColor provides an integral monitor calibration process which has been designed to more accurately reproduce both CMYK and Spot colour rendition when compared to standard ICC profiles. It enables different press/material/ink characteristics to be shown on-screen in the form of a Dot Gain Curve library which can be changed on-the-fly, without the need to re-calibrate. This feature also accepts Star Proof calibration chart readings allowing users to import Star Proof calibration curves with ink hue and dot gain information. 4) Colour Library - MaxPro/MaxColor allows users to import multiple colour libraries for use in colour conversion and on-screen viewing. Custom Spot colours such as those created from ink draw-downs on different materials can also be imported to assist in accurate on-screen colour rendition. 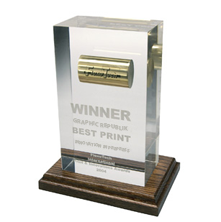 A Silver Metallic Pro option was also shortlisted in the Prepress innovation category. Silver Metallic Pro is an option to MaxPro, developed to automatically produce special White Ink separations for printing on Metallic foil or board. Once images are converted, an on-screen Metallic View feature enables the user to check the result while adjusting the light reflection intensity and angle to simulate the print ink and material combinations.